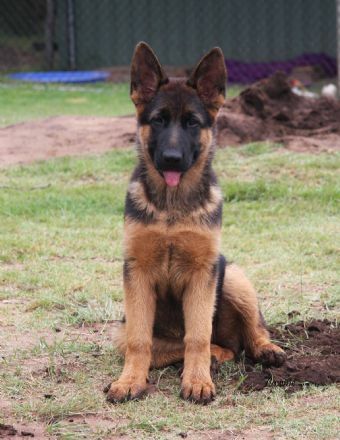 Kenzi is our beautiful black and tan female who comes from our beautiful imported in dam female "Jemma" and Andacht Raz N Hell "Vincent" whose parents need no introduction - his mother Andacht Super Fortress "Tess" a super female who is very special. Tess had an outstanding show career being highly placed throughout her career and the highlights being - called out 1st at 3 consecutive Nationals and receiving dual silver medals together with holding the title of dual NSW State Seigerin. 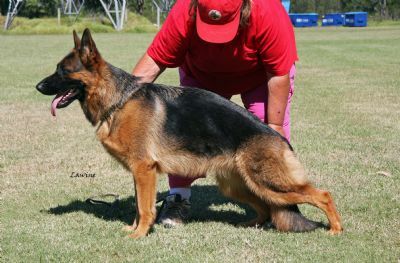 Vincent's father is the outstanding producing male - Cayos von der Noriswand.